AV János Végh, Budapest, Hungary, has been constructing some GK-NF 24 buildings sent to the Baukunst im Kleinen (BiK - Fred Hartjes & BiK web site). These buildings have been carefully designed to be excellent representative models for specific GK-NF sets. AVs build them to establish that 1) the building can be built using only the stones in the set, and 2) that the designs do not require extraordinary building skills. 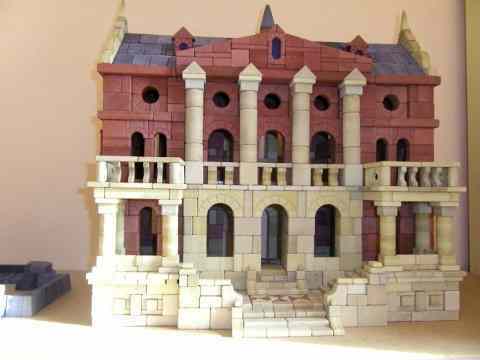 The GK-NF "Wasserpalais" on the builder's page is a design by Falk Gundel, Dresden, Germany. The other BiK books, for smaller GK-NF sets are also on the Internet at http://www.ankerstein.ch/downloads/CVA/CVA.htm. The plan books for GK-NF 24 are a work in progress; the plan books for the smaller sets are completed and are in the "CVA Internet Archive". CVA meeting: Saturday, April 21, 2012; Hotel Lapershoek in Hilversum, Netherlands. On Wednesday, October 26, 2011, AV Brukhard Schulz died. He, more than anyone else, is responsible for the headline above. If you find the Anchor information you are looking for on the Interent, you can thank Burkhard. He will be missed by many -- his personal friends and his Anchor friends. You can now download the entire CD-ROM archive from a new web site. Mor than 6 gigabytes of data are there, including everything that was on the CD-ROMs. The CVA archive on CD-ROMs has been discontinued. Use the Internet! For the month of March, 2012.